It’s somewhat rare to find a new maker entering the market — so often new releases are simply redesigned models from established manufacturers — so it makes a nice change to be able to test something fresh from time to time. 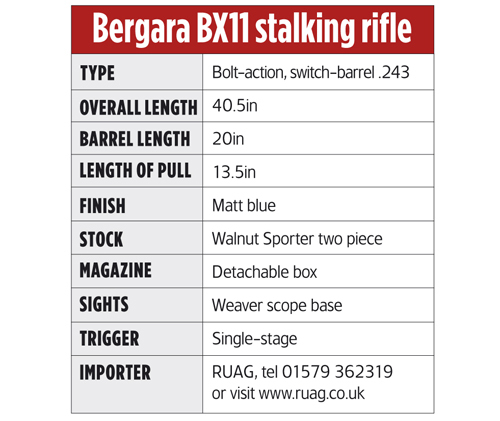 Though it is new to the rifle market in this country, Bergara has long had a following among shooters in its home country of Spain, and from around the world. This is primarily due to the barrels that the company makes, which are finding their way on to rifles here in the UK due to their quality. 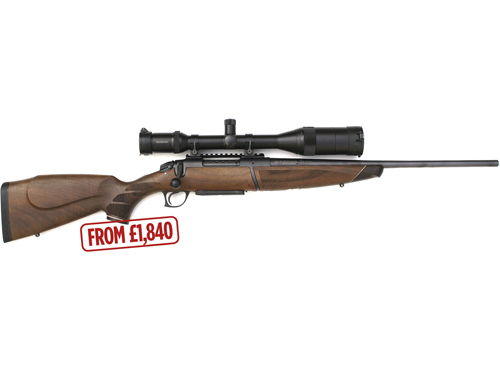 The BX11 on test is a bolt-action Sporter that is available with either a synthetic or wood stock and in cartridges from .243 Win to .375 Holland & Holland. The rifle follows the trend towards a quick-change barrel facility to add versatility of use from a common action. Outwardly it’s a short, handy stalking rifle with a refreshing styling change over that which we are used to in the UK. One reason for the popularity of Bergara’s barrels is the input into their design and manufacture from Ed Shilen, a highly regarded barrel maker in the US. My first custom rifle was made by Ed when I was 21, and I have had many Shilen barrels since for wildcat rounds I have created, so I was interested to see how the Bergara’s shot. The .243 barrel is 20in long with a 0.59in diameter muzzle, and though it is not threaded for a sound moderator, it has a nice stepped muzzle crown to protect the rifling — all finished in a satin/matt bead blasted blue to reduce reflections. The barrel is removable and has two large retaining screws that clamp it securely in the forward receiver ring. The bolt locks in the back of the barrel for extra security and has six locking lugs, just in case — three large forward ones and three rearward ones arranged at two, six and 10 o’clock, with a plunger-type ejector set in the bolt face and a claw extractor at the 10 o’clock lug position. The bolt is 8in long, which is common in many switch barrel rifles that need to accommodate many calibres. The bolt head is removable to cater for differing cartridge sizes. There are also four large ports on the bolt body to allow gases to escape in the event of a punctured primer. The action is cast and has the same finish as the barrel, while the receiver top has a one-piece Weaver rail attached to mount a scope. Some .243 loads are close to being deer-legal with bullets of a certain weight and in varying barrel lengths — here, the Bergara’s 20in-long barrel proved interesting. With primers and certain reloading powders becoming difficult to find these days, I added some alternative powders that are available rather than the staple diet. 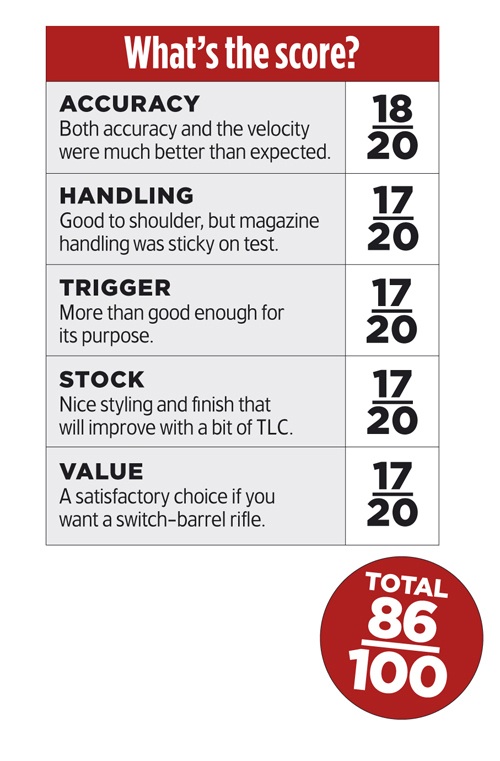 The Bergara must have tight barrels, as the velocities — even with the short, 20in barrel — were excellent. The Geco 105-gr bullet — an excellent-value round — shot an amazing 2,811fps for 1,843ft/lb from that short barrel. Grouping averaged about 1in, which is still very good for a slim Sporter barrel. The Winchester 95-gr Silver Ballistic Tips shot a 95-gr bullet at 3,011fps for 1,913ft/lb (that’s really travelling!) and printed three shots into 1.25in. 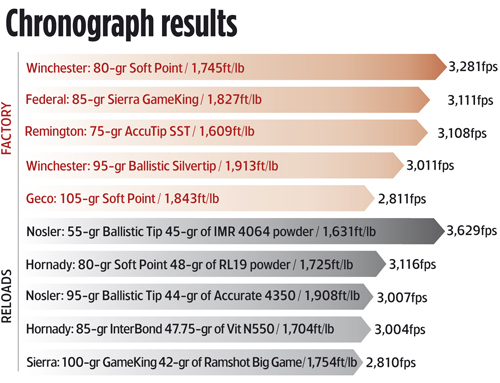 The reloads were sedate by comparison, but the best accuracy came from the Hornady InterBond 85-gr bullet in front of 44.75-gr of Vit N550 powder for 3,004fps and 1,704ft/lb and 0.75in groups. The Nosler 95-gr Ballistic Tip also shot well, to 0.75in, with 44-gr of Accurate 4350 powder for 3,007fps and a healthy 1,908ft/lb. Removing the barrel and then re-shooting a group only altered the group’s impact by less than an inch. The magazine is the detachable type, with a single-line feed of three rounds in this .243 calibre. It’s made from plastic and aluminium sheet and, unusually, fits directly into the opening of the stock without support from an internal well. This is a bit fiddly and causes it to stick a bit when inserting or removing it. The trigger is adjustable and is a single action unit with adjustment for travel and weight. The final pull weight was 2.65lb, which is fine for a sporting rifle such as this. The safety catch is sited on the right rear of the action and is a simple lever with a red dot to indicate fire and a white dot for safe. 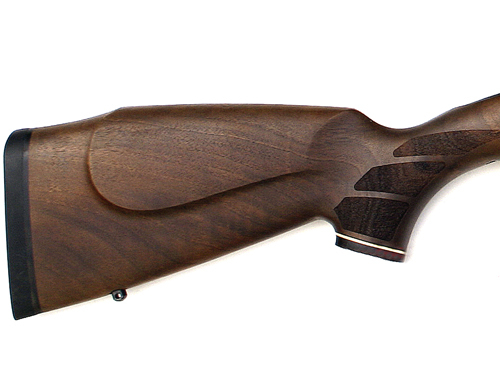 As with most switch-barrel rifles, the stock is in two sections — the fore-end is quickly removed, just like on a shotgun, via a lever that engages a hanger braced from the action’s underside. The rear section is held by two large Phillips screws and, as with the fore-end, is made from walnut. It is a bit plain, but a light rubbing with some oil will enhance it no end. The stock is ambidextrous, with no cast, a twin cheekpiece and a solid black recoil pad. The chequering, or in this case stippling, is applied in three panels to the pistol grip and one large panel to each side of the fore-end — all finished off with rosewood caps. It’s good to see an alternative to the switch-barrel rifles from Blaser, Sauer and Mauser — and at a cheaper price. The velocity and energy figures were impressive, and must be due to the barrel internals. The trigger-guard spur looks a bit odd, and the lack of a magazine well is an oversight, but the handling was good and it would make a practical hunting arm, especially with the synthetic stock fitted. 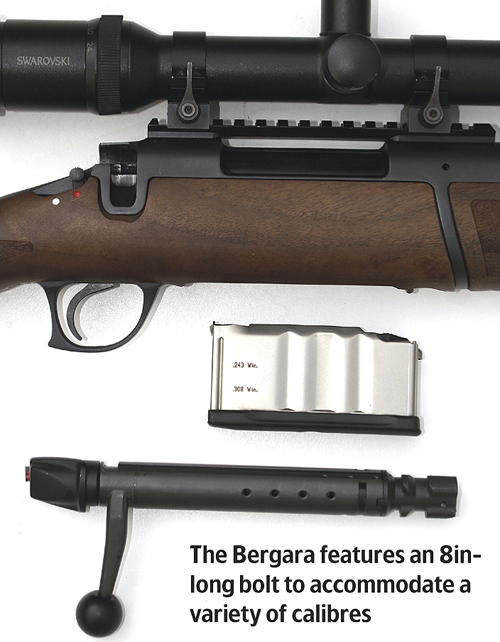 As a relative unknown, it may take a while to be accepted, but the Bergara’s accuracy will win it fans.